Welcome to the Black Sheep Inn and Spa – a magnificent and unique Bed and Breakfast! Featuring a distinct octagon shape, nestled on almost 3 acres, less than 1.5 miles to Keuka Lake and situated on one of the busiest wine trails in the Finger Lakes! 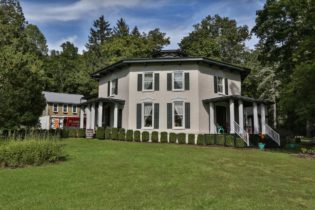 Boasting 5 guest rooms-each with private bath, both social and private dining options, lounge area, mercantile shop, “spa room”, and a second floor “ball room” with a beautiful cupola! A lovely and spacious patio for your guests to relax and enjoy. Large kitchen with loads of storage – great for cooking those delicious breakfasts. Main house owners area along with full owners quarters in the second story of the barn (bedroom, kitchen, bath, and loft). There is so much more to this TURN-KEY Bed and Breakfast – please call for additional details! Rare Seaside Compound In A Storybook Setting. Rare Seaside Compound In A Storybook Setting. 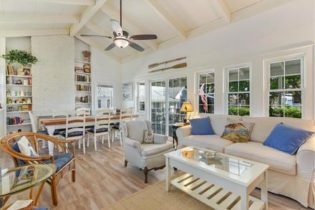 Sitting Pretty, One Block From The Beach, Main House and 3 Cottages On One Lot, With Bay Views, In The Popular Maritime Hamlet Of New Suffolk. In All, 7 Bedrooms And 5 Full Baths. Hamlet Business Zoning, Low Taxes. 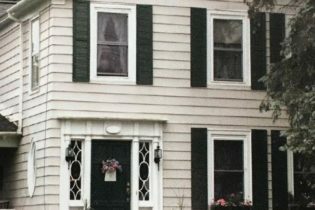 Charming Bed and Breakfast in the heart of Watkins Glen! A short drive...a world away! An amazing opportunity to own the exquisite Genesee Country Inn in the Rochester / Finger Lakes region! The reviews and the pride in ownership have been top notch, with an abundance of repeat customers! 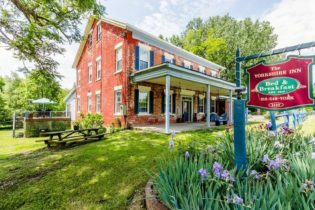 This beautiful B&B features 10 stunning Guest Rooms (all suites with private baths), Sun Room, Common Area, Deck overlooking the Fountain and Spring Creek, Office, Fully Equipped Commercial Kitchen, and Spacious Dining Room (seats 25) – all sitting on a peaceful and tranquil acre of land in a fantastic location! 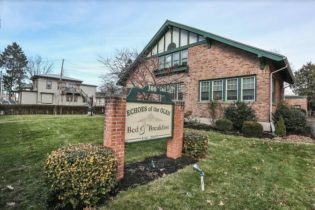 Close to universities, golf, the Oatka Trail and within a short distance of Niagara Falls, the Erie Canal, and Letchworth St. Park. Steady business that includes weddings, bike tours, reenactment actors, and much, much more! Don’t let this pass you by! 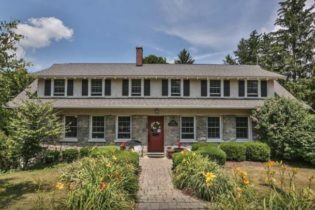 This lovely 1870’s Colonial home located in the heart of Central NY in the village of Madison has high ceilings and beautiful hardwood floors. The house has four spacious guest rooms on the second floor each with private baths. The private owners quarters is on the first floor just off the kitchen with bathroom, large walk thru closet, bedroom, den / office and private rear entrance to a three season porch. The kitchen has been newly renovated and has two ovens and two sinks. The living room has a wood burning fireplace, while the dining room can seat ten guest comfortably. The side porch is a great place for guest to relax and socialize. There is a large detached garage with a loft for storage, and is equipped with sub panel and an electric door opener. The B&B is located just minutes away from Colgate, Hamilton and Morrisville Colleges and is surrounded by area antique dealers in the Villages of Madison and Bouckville NY. The Bouckville Antique show is featured twice a year. The smaller show is early June, and the larger show that hosts over a thousand vendors is in August. Madison Lake is just a short walk from the B&B. The spacious main hall with open staircase, not only greets our visitors, but serves as the hub of the house since the entire first floor is dedicated to the business. To the right you will enter the grand dining room & the formal living room with a restored fireplace updated to natural gas. Pass through the archway into a wide open gathering room where all the guests are invited to mingle and relax. The space features more seating, a dry bar, an Amish made table for playing family games, and a less formal atmosphere with a bit of whimsy. Two of the guest suites are also in this wing. The opulently appointed Bolero Room offers a romantic getaway featuring a two person Jacuzzi tub and individual shower. The Lodge Room is a two bedroom suite that sleeps up to 6. Trimmed in rough sawn cedar it boasts a traditional bath with a tub and shower combination. To the left of the main hall, you will find the oversized country-kitchen with a walk-in pantry, second laundry area and a half-bath. The kitchen was fully remodeled to allow two cooks to operate simultaneously without getting into each other’s way. The professional, stainless steel appliances and extra sink make it easy to prep for your guests each morning. Straight to the back of the house, again off the main hall, you will encounter two more guests suits – The Rose Room and The Blue Room. The Rose Room is a two bedroom suite that sleeps up to 6, has a private bath, large windows overlooking the backyard as well as a second door that opens directly onto the deck. The Blue Room sleeps two, has a private bath and features a wall of south facing windows overlooking the deck and backyard. Both the Blue and Rose baths feature an oversized, seated shower with a very low step for entry to accommodate our older guests. Finally, follow the hall all the way to the back of the main floor to the generous deck, running the length of the house with stairs to the private, multi-acre yard complete with a firepit and patio for all the guests, and you, to enjoy! A true Adirondack Inn in the heart of the High Peaks, a hiker's paradise and an outdoor wonderland. Just south of Lake Placid and a short drive to Whiteface Mountain for winter skiing along with the Olympic cross county and bobsled venues. The Ausable River and world class fly fishing is less than 20 minutes drive. A unique opportunity to own a true historic Adirondack Lodge in the heart of the High Peaks. Owners are retiring after more than thirteen years of owning the Trail’s End Inn. 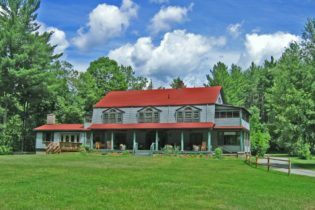 The Inn is located 18 miles south of Lake Placid in Keene Valley, in the center of the Adirondack Park’s mountains, the premier hiking and fishing area of the Adirondacks. Hiking trails literally within walking distance of the Inn’s front door. Cross country skiing at the Olympic site and downhill skiing at Whiteface Mountain, 13 miles from the Inn. The Inn has 13 guest rooms, four with sleeping porches. All rooms are tastefully decorated. Room amenities vary from four rooms with two shared hall baths to rooms with private baths, wood burning fireplaces and whirlpool tubs. There are two-room suites with private baths that offer large comfortable space for two or more guests. The main Inn has four spacious common rooms with two wood burning fireplaces, a kitchenette for the guests, a huge new breakfast room with a fireplace, mud room with a shower and two additional toilets. The entire Inn is wi-fi connected with cable high speed internet. The Inn’s kitchen, pantry and laundry are well equipped including a complete laundry facility with washers, dryers and rotary iron. The main Inn has been painted and re-roofed. Also, two new heating and hot water systems have been installed. A new septic system was added in 2004. Extensive electrical work has been completed including an underground commercial 400 amp service, and new wiring in much of the older portion of the Inn. The front porch foundation has been completely re-built and the porch re-covered with no-maintenance composite decking. In addition to the rooms at the Inn, there are three separate cottages. One cottage is located at the Inn, two other cottages are located in Keene on the Ausable River. Each of the three cottages has at least two bedrooms, a living room, bathroom and a fully equipped kitchen along with either a wood burning fireplace or wood stove. Two of the cottages have whirlpool tubs. In 2013, one of the cottages on the river was totally rebuilt from the foundation up. The other two cottages have been painted and had new roofs. The owner’s quarters is spacious with three bedrooms, bath, kitchen and living room. There is a new large heated two-car garage with separate exercise room. Due to the unique size and location of the Inn, it provides a perfect venue for groups, reunions and weddings. In addition, because of the various types of rooms, the Inn caters to many different budgets from those looking for a simple room to those looking for upscale amenities. The sleeping porches are a true Adirondack amenity that the guests enjoy during the summer months. The Inn also benefits from its proximity to Canada, resulting in a strong Canadian following, even during times with a strong US dollar. The properties have been professionally maintained, expanded and improved. All work has been done to code and the Inn has passed an annual New York Health Department inspection. There are time-tested systems in place for efficiently operating the Inn, including marketing and reservation software. Our guests are the best and they like us a lot too. See the reviews on Bedandbreakfast.com, Google, Yelp and TripAdvisor. Once they come, 50 % repeat.